What better place to start with your design for employee uniforms than to let the feedback of your team to guide you? It’s no question that great uniforms are an essential part of any business. As one of the most consistently present displays of your brand, your employee uniforms play an important role in representing your business, also demonstrating the professionalism of your team and services. If you are in the process of developing new uniforms for your team this season, consider these tips on knowing where to start as you design a new great uniform for your business. 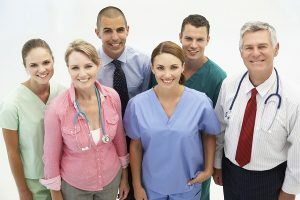 Before you decide on any smaller details of your new employee uniforms, consider their function and amount of comfort that they will provide to your employees. Certain materials, such as cotton, may be more comfortable for employees who are working outside throughout the summer, whereas long sleeve shirts may be more ideal for employees who are working inside. Because the physical demands of each employee may vary in different parts of your business, it is important to consider the different styles that may be required to fit their needs. What better place to start with your design for employee uniforms than to let the feedback of your team to guide you? Gather feedback from your employees of various roles regarding the color, comfort, and style of their uniforms so that everyone on your team feels well represented and comfortable on the job. Ensuring that your employees are comfortable and happy as they work is a great way to boost morale and maximize productivity for your business. If your business has a colorful logo, as well as a recognizable mascot or emblem, your brand will easily speak for itself on your employee uniforms. Be sure to choose a simple color and design that will allow your brand to be recognized as it is represented by your team. If your logo is more simple, it may be better to choose a distinct pattern or design for your uniforms in order to build your brand and strengthen its presence against the competition in your industry. With this, any positive interactions that customers have with your employees, products, and services will help to build a positive association with your brand as it grows over time. For over forty years, Lord Baltimore has provided cost-effective uniform rental services throughout the East Coast, including Maryland, Washington DC, Northern Virginia, Southern Pennsylvania, and Delaware. To learn more about how uniform rentals can keep your business clean and looking great, please contact Joe Bateman at Lord Baltimore by calling 800-292-1224 or visit LordBaltimoreUniform.com. We also handle towel rental for gyms and salons, as well as apron, towel, uniform and mat rental and purchase for restaurants. Additionally, we also sell and rent uniforms, shop towels, fender covers and mats for manufacturing and automotive industries. This entry was posted on Friday, June 1st, 2018	at 9:19 am	. You can follow any responses to this entry through the RSS 2.0	feed. Both comments and pings are currently closed.